Open borders supporters can highlight certain remarks that appear to support our cause, especially the sentence “Let us seek for others the same possibilities which we seek for ourselves.” For immigrants from developing countries to enjoy the same opportunities as people living in developed countries, they must be allowed to enter and remain in advanced countries. And it seems impossible to treat immigrants in a way that is “humane” and “just” under a policy of restrictions. (The group No One Is Illegal states that “the achievement of fair immigration restrictions… would require a miracle.”) At the same time, those opposed to open borders could reference a remark in the Pope’s speech (not quoted above) in which he states that the world refugee crisis “presents us with great challenges and many hard decisions.” One might infer that those decisions might involve accepting some migrants into destination countries and refusing others. The Golden Rule also could be seen as supporting a limited version of open borders. It would support open borders for citizens of countries with comparable economic prosperity. For example, Argentina, Chile, and Uruguay have roughly the same per capita GDP. It would make sense that citizens of any one of these countries would have the other two countries allow them to migrate freely to those countries to pursue economic opportunities, so they should have open borders for citizens of the two other countries to enter their country. Pope Francis’ comments about treating immigrants with compassion are inspiring. However, I disagree that the Golden Rule “points us in a clear direction” about how to respond to immigration. It is too malleable to provide a moral foundation for immigration policy. In a previous post, I noted that, in my opinion, the best argument for open borders is that it would allow people, not their birthplace, to control their lives. Open borders would offer people who had the bad luck of having been born in poor and/or unsafe countries the opportunity to escape their unfortunate circumstances and find a better life in a safer, more prosperous country. It is wrong for the lucky who were born in the developed world to deny this opportunity to the unlucky who were born in poor countries, to paraphrase the ideas of several other critics of immigration restrictions. How persuasive is this argument? Research on the role that awareness of one’s luck has on one’s generosity suggests that the argument, by reminding people of their good fortune in having been born in the First World, could be effective. A recent article in The Atlantic by Robert Frank of Cornell University focuses on this connection between being aware of one’s good luck and a willingness to help others. Mr. Frank notes that when people disregard the role luck plays in their success, they are less generous. However, “… when people are prompted to reflect on their good fortune, they become much more willing to contribute to the public good.” He cites experiments in which subjects who are induced to feel grateful or consider factors outside their control that have helped them are more generous towards strangers than subjects in control groups. As open borders advocates consider which arguments are most likely to convince more people in advanced countries to embrace open borders, this focus on making individuals aware of the huge role that their place of birth has had on their lives could be potent. Of course, this message would be received better by those who are prospering more than others. As the Brexit vote has shown, many of those who are struggling in the developed world are in no mood for increased immigration. Mr. Frank observes that successful people in the First World tend to overlook the role luck plays in their success: “Most of them are vividly aware of how hard they’ve worked and how talented they are. They’ve been working hard and solving difficult problems every day for many years! In some abstract sense, they probably do know that they might not have performed as well in some other environment. Yet their day-to-day experience provides few reminders of how fortunate they were not to have been born in, say, war-torn Zimbabwe.” If the open borders movement can provide more such reminders, it could be significantly strengthened. In the United States, reparations for harm committed against certain ethnic groups by the government have periodically been considered. Decades after the government interned over one hundred thousand Japanese-Americans during War II, the U.S. provided monetary reparations to former internees. Reparations for African Americans and Native Americans have also been debated, including Ta-Nehisi Coates’ recent article “The Case for Reparations” concerning African Americans. The malign actions committed against these groups by the government and European American citizens have been horrific. Forcible relocation in the case of Japanese and Native Americans. Wars of aggression against and theft of land from Native Americans. Slavery, Jim Crow, de facto slavery after the Civil War, theft, unpunished murder, federal redlining of African American neighborhoods, and the mass incarceration of African Americans. The fruit of this oppression, in the case of African Americans, has been a huge wealth gap between African Americans and the rest of the country, as well as high incarceration rates. Actions by the U.S. government against would-be immigrants have also been devastating. Millions of individuals have been deported from the country over the years, leading to immiseration, family separation, and sometimes death. (While not strictly a case of deportation, 254 refugees from the ship St. Louis, which was denied entry into the U.S. in 1939, died in the Holocaust. More recently, a man deported in 2012 to El Salvador, “dubbed by the United Nations as one of deadliest countries in the world,” was murdered earlier this year by assassins hired by a disgruntled former tenant. A forthcoming study shows that close to one hundred deportees to Central American from the U.S. have been murdered over the last two years.) Moreover, hundreds of thousands of people have been detained each year and others harmed, even killed, by immigration agents. In addition, thousands have died in deserts trying to evade border enforcement along the southern U.S. border, while others have suffered abuse by non-government entities in transit to the U.S. or after arriving in the U.S. due to their undocumented status. Furthermore, immigration restrictions on would-be immigrants have kept many in the developing world from escaping poverty. Restrictions prevent would-be immigrants from benefiting from the place premium, which allows a person from a disadvantaged country to earn much more in an advanced country, even without an increase in the person’s skills. A paper by Michael Clemens and others concludes that “simply allowing labor mobility can reduce a given household’s poverty to a much greater degree than most known antipoverty interventions inside developing countries.” Restrictions also have blocked would-be immigrants access to a decent education in the U.S., which would increase their earnings potential. In addition to locking would-be immigrants into poverty in the developing world, restrictions force them to work for low wages in dangerous conditions in sweatshops they would otherwise avoid by migrating. Some commentators have argued that having sweatshop jobs in poor countries is preferable to not having the jobs available at all (Nicholas Kristof: “… the central challenge in the poorest countries is not that sweatshops exploit too many people, but that they fail to exploit enough.”). However, they fail to acknowledge that the fact that there are only these two alternatives is due to, as John Lee argued in a 2013 post on Bangladeshi sweatshop workers, “laws that ban Bangladeshis at gunpoint from working in our countries.” John’s post was published in the wake of a factory fire in Bangladesh that killed over 1,000 people, some of whom might have migrated to the U.S. under open borders rather than toiling in the unsafe factory. Consider also women living in countries where they are mistreated who might escape to the freedom of the U.S. under open borders. It is difficult to determine the number of women who have been forced to endure misogyny in other countries because of restrictions, but it may be many. Nonetheless, here are some ideas for reparations for immigrants under open borders. Part of a reparations package would be to grant immigrants immediate, full access to the American welfare state: Obamacare, Medicaid, Medicare, Social Security, TANF, job training, Pell Grants, federal student loans, housing assistance etc. For those concerned about elderly immigrants arriving to our shores and claiming benefits to which they have never contributed, remember that they would have happily contributed earlier had open borders been available when they were younger, and besides their personal finances have often been decimated for years due to immigration restrictions. With a center-left perspective, I believe some of these investments could reap later rewards, such as making it easier for new immigrants to attend college, which would in turn enhance productivity. Admittedly this all may be difficult for most people to accept: open borders and instant access to the welfare state, a cash allowance, low cost-housing, and travel assistance. Open borders plus reparations may not be popular even among many of my fellow open borders advocates. For example, it differs greatly from Nathan Smith’s DRITI open borders plan, which burdens new immigrants with higher taxes than native-born Americans. Mr. Coates has written about the deeper value of advocating for reparations (in the case of African Americans): “I believe that wrestling publicly with these questions matters as much as—if not more than—the specific answers that might be produced… An America that looks away is ignoring not just the sins of the past but the sins of the present and the certain sins of the future.” Similarly, providing reparations for immigrants entering under open borders could eventually help instill the idea in Americans’ hearts and minds that restrictions have constituted a great sin against a large portion of humanity, hopefully incubating Americans against reverting back to immigration restrictions. Reparations are not a sound basis for making immigration policy by John Lee, that argues against using reparations as the basis for liberal migration policies. At issue is the fate of a relatively small group of Syrian refugees, only 10,000 out of millions seeking a safe home abroad. Open borders advocates like myself would prefer the admission to the U.S. of as many refugees as wish to come, excepting any who might be security threats. But accepting the 10,000 is better than not accepting any. It is the right thing to do from an open borders perspective, and as Phil Mader and I have argued, a tool for dealing with terrorism. Mr. Mader points out that refusing Muslim refugees would alienate the refugees, who could be our “natural allies” if allowed to immigrate. Similarly, I have noted that Muslim immigrants could provide cultural and language skills in the effort against Islamic terrorism. Indeed, the terrorist risk to the U.S. posed by the refugees, who will undergo rigorous screening before being admitted, and by Muslim immigrants in general, is minimal, especially when compared to other threats. As has been previously observed, most Muslims are peaceful. American currently has over 2.5 million Muslims, about two thirds of whom are immigrants, but very few are involved in terrorism. Since 9/11, there have been 26 people killed and about 200 wounded from jihadist attacks in the U.S. (An attack by a Muslim immigrant that killed 4 marines in Tennessee last summer also may have been motivated by radical Islam. ) Most of the eight attackers were born in the U.S., and some were African-American, with no apparent recent immigrant ancestors. Meanwhile, American right wing extremists have killed more people (48) in the U.S. since 9/11 than have radical Muslims. Most of these attacks were committed by white male Americans. And the second deadliest terrorist attack in U.S. history was committed by a white antigovernment extremist in 1995: the truck bombing of the federal building in Oklahoma City which killed 168 people, 19 of whom were children. shootings in the U.S. Mother Jones collected more than thirty years of data on public mass shootings in the U.S. which involved indiscriminate killing and the killing of at least four people. Apparently 44 out of 64 perpetrators were white males with no apparent connection to Islam or immigration. (2 of these mass shootings were included in the data on right wing and jihadist attacks.) Dana Ford of CNN writes that “the man who opened fire at a Charleston church on June 17, killing nine people, joined a list many would like to forget. Dylann Roof. Adam Lanza. James Holmes. Jared Loughner. Eric Harris and Dylan Klebold. Their names stir painful memories and conjure images of hate and violence. The killers have other characteristics in common too: They either were, or are, young, white and male.” Texas mayor Mike Rawlings states that he is “more fearful of large gatherings of young white men that come into schools, theaters and shoot people up” than Syrian refugees. More importantly, all of these jihadist and right-wing attacks and mass shootings are extremely rare and account for a minuscule portion of premature deaths in the U.S. According to Politifact, about 300,000 people in the U.S. have been killed by guns over the last decade, compared to less than a hundred deaths from extremist, both right wing and jihadist, attacks. Deaths from mass shootings have been in the low hundreds in recent years. Beyond violent deaths, over a third of early deaths in the US. are due to behaviors such as using tobacco, eating a poor diet, and not getting enough exercise. According to the Population Reference Bureau, “diet alone accounted for more than 650,000 early deaths in 2010.” Almost 19,000 people were killed in car accidents during the first half of this year, along with nearly 2.3 million “serious injuries” from the accidents. Tens of thousands more die each year from chokings, fires, falls, drownings, and poisonings. Of course, a single terrorist attack can cause enormous carnage and destruction. The 9/11 attacks killed almost 3,000 people directly and caused billions of dollars of damage. And the problem of jihadi terrorism may more likely arise in the offspring of immigrants. The Paris attacks were committed by Muslims who were apparently born in Europe. However, the U.S. doesn’t seem to have a large number of alienated Muslim residents like Europe does, who may be more prone to committing acts of terror like those seen in Paris. Fortunately, America does a better job than Europe at integrating its immigrants. It should continue to improve its ability to integrate newcomers, including Muslims. As for catastrophic events like 9/11, fortunately they are rare, 9/11 itself was the work of temporary visitors to the U.S., not immigrants, and, as discussed, having more immigrants enter the U.S. could help our intelligence agencies foil future attacks. In addition, it should be noted that, as deadly and shocking as 9/11 was, the attack’s toll is dwarfed by the number of deaths resulting annually from accidents, guns, poor diets, and other causes. Moreover, rigorous screening of entrants from abroad, whether immigrants or temporary visitors, without significantly hindering the flow of immigrants, should continue to be the goal. The minimal harm that Islamic terrorism has caused in the U.S., both absolutely and in comparison to other causes of early death, should reassure those concerned about the threat of terrorism from immigration, whether it involves 10,000 refugees or larger flows under open borders. As Mr. Inslee recommends, people need to realistically assess this risk. Terror in Paris and Open Borders by Nathan Smith. Ebola is utterly irrelevant. Open the borders. by John Lee. Crime in the US under open borders by Vipul Naik. Junk the international refugee system, and open the borders by John Lee. There are a prodigious number of moral arguments for open borders. Openborders.info lists libertarian, utilitarian, egalitarian, and other types of cases for open borders, with a number of arguments within each category. What are my favorite arguments for open borders? Before answering this question, it is important to consider what constitutes a strong argument for open borders. First, it should be logical. Second, it should not be overly complicated, requiring layers of explanation. Finally, it should, in the words of Fabio Rojas, appeal to “basic moral intuition;” it should resonate emotionally. While each of the following arguments may not contain all of these elements, they have at least some of them. 1. Open borders allow people, not their place of birth, to control their lives. In a world of relatively closed borders like ours, citizenship is an inherited status and a source of privilege. Being born a citizen of a rich country in North America or Europe is a lot like being born into the nobility in the Middle Ages. It greatly enhances one’s life prospects (even if there are lesser and greater nobles). And being born a citizen of a poor country in Asia or Africa is a lot like being born into the peasantry in the Middle Ages. It greatly limits one’s life chances (even if there are some rich peasants and a few gain access to the nobility)… Is there some story that they [people in rich countries] can tell to the human beings on the other side of this rich-poor divide as to why these existing arrangements are fair? Would they think the arrangements were just if they were in the position of the excluded? I don’t think so. 2. If before you were born you didn’t know where you would be born (and who your parents would be) but could choose what the laws would be, you would choose laws allowing open borders because they could be key to your well-being. This argument is very logical and probably appeals to the moral intuition (or at least the self-interest) of many people by helping them achieve a global perspective. I have not seen the argument used frequently, however, probably because its logic is somewhat intricate. It was used by John Tierney almost a decade ago in an op-ed calling for expanding immigration to the U.S. Despite its infrequent use, it is a potent case for open borders. This argument was formulated by Michael Huemer of the University of Colorado. In “Is There a Right to Immigrate?” he argues that unless special circumstances can be identified, physically barring immigrants from entering a country and expelling those already inside a country are violations of immigrants’ rights not to be harmfully coerced. (p. 434) Mr. Huemer addresses a variety of justifications for this coercion against immigrants, including claims that immigration hurts native workers, that immigrants fiscally burden natives, that the government should prioritize the interests of disadvantaged natives, and that immigration threatens natives’ distinctive cultures. Mr. Huemer effectively shows that these justifications do not override immigrants’ right not to be harmfully coerced through immigration restrictions. This argument is logical and straightforward. It is not necessarily morally intuitive, since some people see government as being in the business of harmful coercion through taxation, regulation, and law enforcement, in order to serve the greater good. The hypothetical of “Starving Marvin” contained in Mr. Huemer’s paper humanizes the argument, however. In the hypothetical, Marvin, a potential immigrant in danger of starvation, seeks food by going to a seller in the U.S. The U.S. government, embodied in a person named Sam, forcibly prevents Marvin from reaching the U.S. Marvin then returns home and dies of starvation. One can also look at situations where borders are currently open for clues about migration flows under worldwide open borders. Philippe Legrain, in Immigrants: Your Country Needs Them, observes that Britain hasn’t been deluged with East Europeans despite the ability of citizens from relatively poor East European countries to come and work there. (p. 328) Mr. Johnson has written that despite the fact that the mainland U.S. has a per capita GDP twice that of Puerto Rico, most Puerto Ricans do not leave (p. 29), although many nations are much poorer relative to the U.S. and about a third of the people born in Puerto Rico have moved to the mainland U.S., which is a significant proportion. Assuming that billions migrate, Nathan’s research suggests, as does that of others, that world GDP would nearly double and that the living standards of unskilled workers worldwide would rise. The impact on Western countries that receive the bulk of the migration would be mixed, but generally positive: “… unskilled workers would see their wages driven down by competition from immigrants. There would be an enormous boom in investment, and elevated returns on capital for decades, as the world adapted to an enormously expanded effective labor supply.” Nathan’s predictions about the impact on the U.S. political landscape in a forthcoming post similarly suggest significant changes, but not ones that should cause an open borders policy to be overriden. Keyhole solutions would also be available to ameliorate the impact on receiving countries. Uncertainty is always associated with radical policy changes, whether they be the abolition of slavery or the enfranchisement of women. This uncertainty should not prevent doing the right thing, however. The three arguments in this post powerfully show that, in the context of immigration policy, implementing open borders is the right thing to do. My Path to Open Borders by Bryan Caplan. My Summer in the Orchard: How I Came to Support Open Borders by Justin Merrill. How do you convince people to sustainably support migration liberalization? by Vipul Naik. 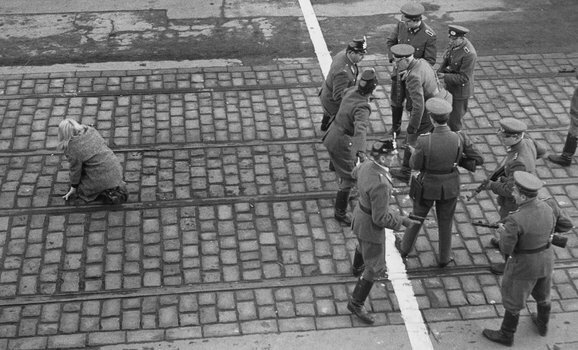 The photograph featured at the top of this post is of West and East German border police confronting each other, moments after a woman successfully crossed the interior German border in Berlin, 1955. Photo by Three Lions/Hulton Archive/Getty Images, via the Google Cultural Institute. My Favorite Three Arguments for Open Borders is licensed by Joel Newman under a Creative Commons Attribution 3.0 Unported License.